City gal Dani Davis just wants to find a place to call home. Miller’s Creek, Texas, with its country charm and quirky citizens seems like the perfect place to start over. Perfect, that is, except for the cowboy who gives her a ride into town… Dani secretly finances renovations to downtown Miller’s Creek, but malicious rumors force her to choose between keeping her involvement a secret and the home for which she’s always longed. Then the discovery of an age-old secret propel her down a road she never expected to travel. Steve Miller is determined to save his dying hometown. When vandalism jeopardizes the Miller’s Creek restoration project, he can’t help but suspect Dani, whose strange behavior has become fodder for local gossips. Will Steve and Dani be able to call a truce for a higher cause, and in the process help Dani understand the true meaning of home? 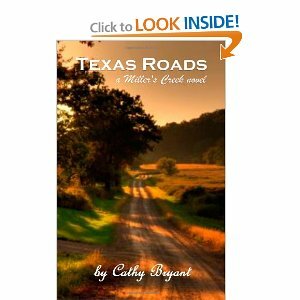 Cathy Bryant’s first novel, Texas Roads, was chosen as a finalist in the 2009 American Christian Fiction Writers’ Genesis competition. She’s written several devotions that have been published in books, magazines and online, and was recently named as a core writer for Full Spirit magazine. A Texas gal by birth, Cathy lives in a century-old Texas farmhouse, complete with picket fence, flowers, butterflies, and late summer mosquitoes the size of your fist. Drop by for a visit atwww.CatBryant.com or at http://WordVessel.blogspot.com. Texas Roads is an endearing and sweet novel. I love all the characters (hmm except for a couple). I even grew to like some of the less endearing characters. This is everything you expect out of a Christian fiction novel about somebody searching for God and peace and also finding love along the way. These type of novels make my heart sing so to speak. I see all the characters growing and changing but it is in the right direction; you see their hearts softening over the long run. There were some hiccups along the way which provided good story lines, and I really felt bad for Dani at times. She has a heart of gold but people like that are sometimes taken advantage of in real life and in books. I was surprised by some things in the end of the book but it was a good surprise. I enjoyed every page of this book and am eagerly anticipating more Miller’s Creek novels. I love the town. Cathy Bryant did a fabulous job of painting the town in words and showing off it’s charm. I now feel like I have been there and have pride in the town. Buy It: You can buy Texas Roads for $12.99. Disclaimer: I received this free of charge in exchange for an honest review. I was in no way compensated for this post. Everything written is my own thoughts and feelings. Thank you! So glad you enjoyed TEXAS ROADS! Thanks for taking time to read and review the book.